Mylls to go...: A Christmas Story 5k/10k Virtual Run - Who's In? Being a child of the 80's who loves the movie "A Christmas Story", I immediately thought "I MUST HAVE THIS." And clicked on the link to read more about the race. Turns out, it's put on by the "A Christmas Story House and Museum." It's the 30th anniversary of the movie (WOW), and there are a bunch of celebrations going on. The race is one of them and the race course actually passes Ralphie's house from the movie. RALPHIE'S HOUSE! Being that I'm kind of insane, I really wanted to go up to Cleveland to run the race. Generally, I'd only travel that far for a half-marathon or longer, but come on! It's "A Christmas Story!" Unfortunately, Dudley and I are already racing the St. Jude's Half Marathon that weekend. While I love "A Christmas Story," the St. Jude's Half is my favorite race of the year and I can't miss it. SO - that brings me to the point of my post. 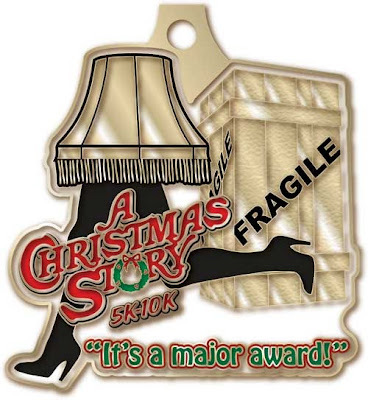 The "A Christmas Story 5k/10k" has a virtual option. I'll be honest, I've never really been big on virtual races, but I've spoken to a few people, and I think this one might have some legs (legs...HA! See what I did there? Because it's a running race...and the leg lamp... Oh never mind). Here's the deal on the virtual run: It's $45, which is the same price as the on-site race. For that you receive a commemorative race bib, an official long sleeve race shirt and... the "Commemorative Limited Edition Race Medal!" Now, is $45 a bit much for a 5k/10k? Yes - but look at the medal. Plus, if we can get a group of 15 or more, we get $3 off. I'm thinking we can meet in Shelby Park (Date TBA) and run our virtual race. We can make it as much of a "real" race as we want (packet pick-up, shirt distribution, maybe a photographer, etc.) - or we can all just go out there and run around Shelby and go home. A group viewing of the movie isn't out of the question. This is all very much in the planning stages. BUT - if you're interested, please let me know. I'm working on getting the group discount code, so don't sign up yet. We need to come up with a creative "Christmas-themed" group name - so you creative types, get on it! What do you think? Who's in?! Spread the word and let me know! !